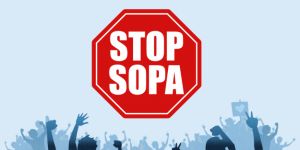 United States H.R.3261 AKA the Stop Online Piracy Act (SOPA), an ill-conceived lobbyist-driven piece of legislation that is technically impossible to enforce, cripplingly burdensome to support, and would, without hyperbole, destroy the internet as we know it. Opponents of the bill now before the U.S. House of Representatives include Google, Facebook, Twitter, Mozilla, Yahoo!, AOL, LinkedIn, eBay, Tumblr, Etsy, Reddit, Techdirt, Wikimedia Foundation, the American Civil Liberties Union, Human Rights Watch, and the Center for Democracy and Technology. The bill is supporters include Hollywood, media firms, the U.S. Chamber of Commerce, and their lobbyists, who have spent over $91 million to push this new law through. If passed, SOPA will allow corporations to block the domains of websites that are “capable of” or “seem to encourage” copyright infringement. Once a domain is blocked, nobody can access it, unless they’ve memorized the I.P. address. For example if you post a link to the story on your Facebook wall. Under SOPA, all of Facebook can be blocked. To avoid this fate, Facebook would be responsible for policing the copyright status of every piece of content its users post. The same happens with search engines, which to avoid being shut down, Google and Bing would be responsible for policing the copyright ownership of every piece of content they index. SOPA would likely do little to achieve their explicit goals of curbing online piracy. They would give corporations and the US government broad powers to censor the Internet, while at the same time making the entire Web less secure.